CSUN biology professor Rachel Mackelprang holds up a frame of a beehive located in the Botanic Garden. Photo by David J. Hawkins. Rachel Mackelprang holds a honeycomb frame. Photo by Patricia Carrillo. 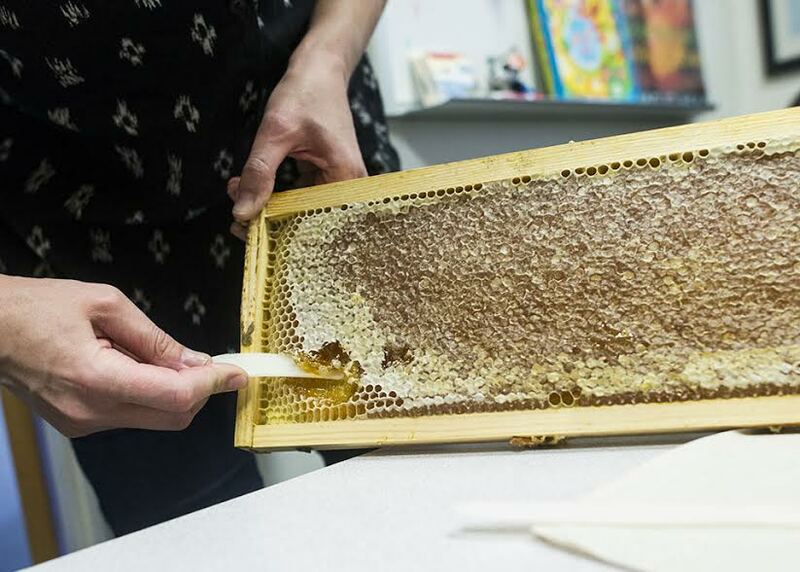 Rachel Mackelprang harvests honey from the beehives she keeps on campus. Photo by David J. Hawkins. Throughout the world, bee colonies have been devastated by a parasite called the Varroa mite. These mites – which are visible to the naked eye – leach on to bees, and have devastated honeybees since the late 1980s. The treatments for this parasite vary; however, recent studies have shown the Varroa mites have built up a resistance to the treatments. 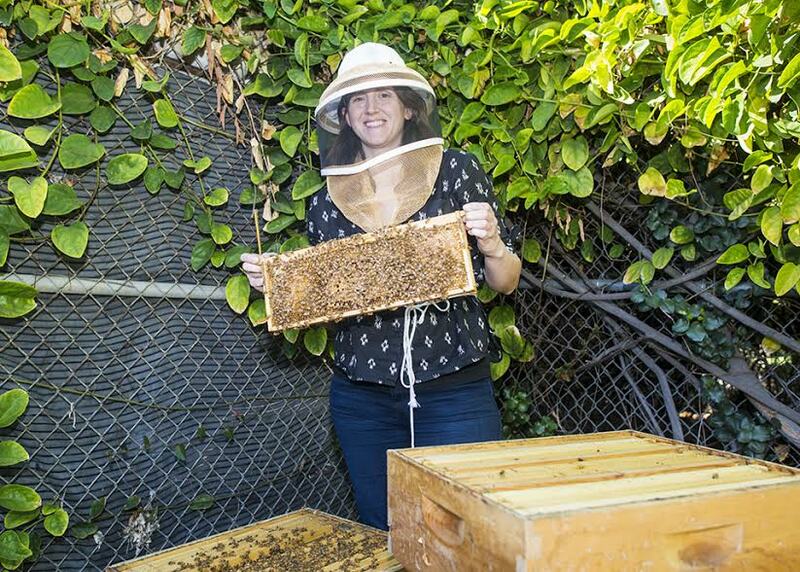 Rachel Mackelprang, professor of biology at California State University, Northridge who conducts studies on microbial communities, has been working to figure out if these treatments are affecting the symbiotic bacteria in the bees’ guts, which may negatively impact their health. Mackelprang stressed the importance of understanding the current treatment and human intervention. “We are in the preliminary stages of this study,” she said, of the research which began in May 2017. “There’s a never-ending list of things we can do and learn from this study. Walking past the Botanic Garden or the Orange Grove to get to class, students may not have noticed the beehives Mackelprang has placed on campus. There are five hives at the heart of Mackelprang’s research. The hives are made up of Italian honeybees, ​which are know for being docile. The hives are surrounded by fences for extra protection ​​​– posing no threat to students, faculty or staff. 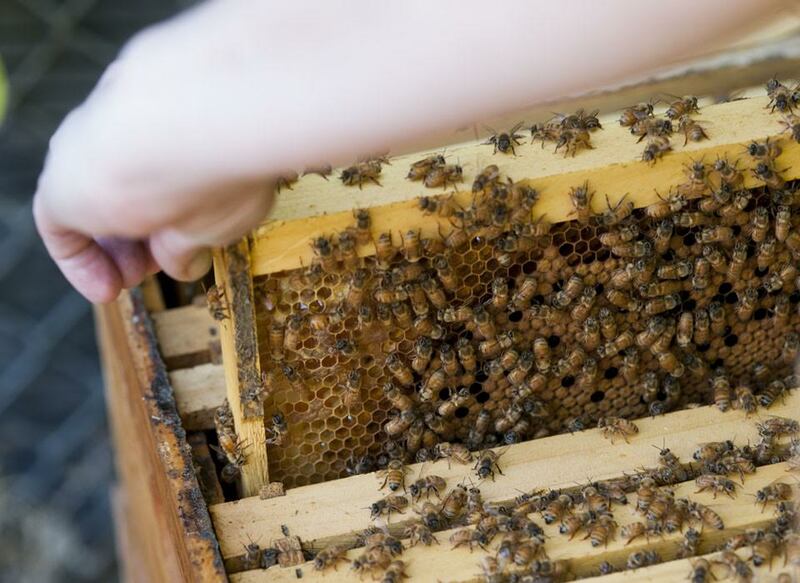 Since 1879, backyard beekeeping was banned in Los Angeles, inspired by inaccurate research that said bees damaged fruit crops and put people in danger. The measure proved to have the opposite effect. It was not until October 2015 that this legislation changed. Eight years ago, Mackelprang visited her father in Spokane, Wash., and helped him with his bee hives. That experience inspired her study. Mackelprang’s is personally funding part of the study by harvesting the bees’ honey ­­— with help from CSUN biology students. She plans to sell the product in collaboration with CSUN’s Marilyn Magaram Center for Food Science, Nutrition and Dietetics. The importance of protecting bees in the ecosystem is crucial, said Mackelprang. She hopes to spread the word to members of the community that if they see a bee colony, they should not try to kill the bees. Mackelprang noted that it’s important to support an environment that’s friendly to bees, including avoiding the use of pesticides, and planting flowers and shrubs that attract pollinators.